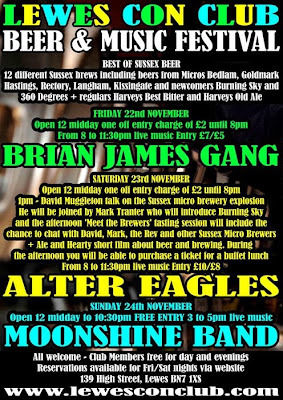 Best of Sussex Micros beer festival will take place on Friday 22nd, Saturday 23rd and Sunday 24th November at Lewes Con Club, 139, High Street, Lewes, East Sussex, BN7 1XS, phone 01273 473076. 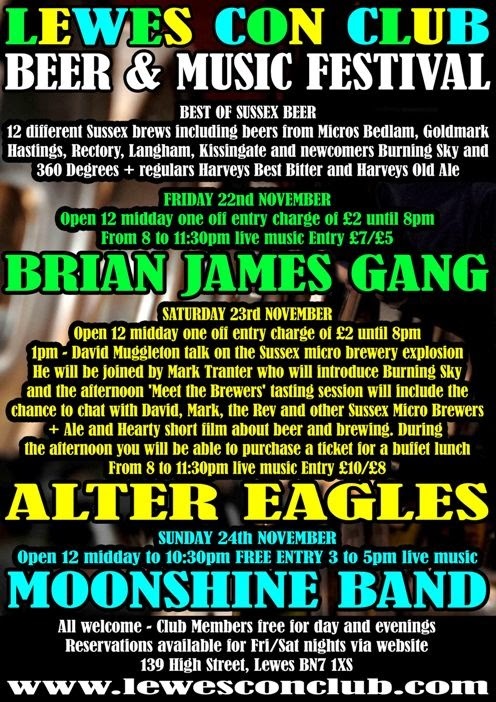 12.00-12.30: Entry with tickets available for beer tasting and buffet lunch. 12.30: David Muggleton (The Quaffer) will introduce the Ale and Hearty DVD, which we will show on club’s TV, and the Ale and Hearty Exhibition. 13.00-13.20: David Muggleton will give short talk on the Sussex Micro Brewery Explosion. 13.20-13.45 David Muggleton introduces Mark Tranter for our first tasting session. Mark gives a brief history of Burning Sky and introduces his two beers for tasting. 13.45-14.30: Break for buffet lunch. We may show the Ale and Hearty film again during lunch. 14.30: David introduces Goldmark Brewers Frank McCabe and Mark Lehmann to talk about how they set up and lead the tasting of their beers. 14.45: David introduces Kissingate Brewers Bunny and Gary Lucas to talk about how they set up and lead the tasting of their beer. 15.00: David introduces Langham Brewer Lesley Foulkes to talk about how they set up and lead the tasting of their beer. 15.15: David introduces Rectory Brewer Rev Godfrey Broster to talk about how he set up and lead the tasting of his beer. Times are approximate and David will act as M. C. and encourage questions and participation. The emphasis will be to have a fun and informative afternoon.